Your inner blossoming, this opening towards life, is at the same time the step into a deep partnership. The “practice of Healing Love”, also called Tao of sexuality, belongs to inner Qigong. In Healing Love, an inner self-healing and rejuvenation process is initiated, which raises vitality in your whole organism and floods all cells with fresh life energy. Therefore, these practices are also an important basis for the Taoist meditations of Inner Alchemy. 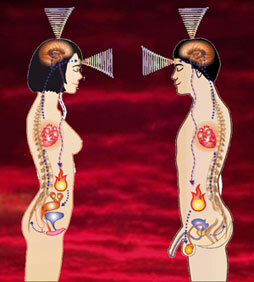 In Taoism, sexual energy is the essence of our being. It is the basis for creativity, artistic creations, vitality and spirituality. The main concern of the practice of Healing Love is the harmonization, multiplication and transformation of sexual power into spiritual energy. Men and women learn to consciously increase the energy of the ovaries and testicles and to guide it into the brain, glands and internal organs via the spine. This is the beginning of the inner self-healing and rejuvenation process. One of the most important themes of the practice of Healing Love is the union of heart and sexual energy. The merging of these two essential forces of life, often accompanied by a deep sense of inner peace, is one of the most important keys to fulfilling sexuality, a deepening partnership and to loving ourselves. At advanced levels of the Meditation of Inner Alchemy this inner marriage of heart and sexual energy also leads to deep meditative states. All techniques also have a positive effect on the treatment of abdominal pain, menstrual disorders, impotence and prostate problems, etc. In our seminars the practices of Healing Love are practiced as a form of Inner Qigong or meditation solely. By combining them with specific body and breathing exercises, they achieve their profound effectiveness. In addition, there you will be given many practical tips as to how these practices can be implemented at home with your partner.